Eurocopter - 5pts. It's nice to a muscle car nominated. Stiff competition against the 200 mph club of supercars, but the Mustang got the ball rolling for the American Horsepower Wars. RC45 - 3pts. Expensive cars in remote areas...novel concept. ae86_16v - 2pts. while the car itself isn't very exciting, it contrasts well with it's background. cowboy007 - 1pt. Nurburgring shots are always appreciated. MIHALS 3 pts - wow just look at the combination of car and setting, perfect, nice pic too (technically)! 3 pts: MIHALS, f355: Great setting for a photoshoot shot, especially cause the restaurant is Italian. I also like the warm colours. 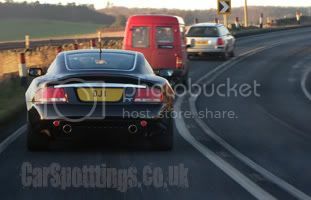 2 pts: davide, MC12 Corsa: The yellow lights contrast really well with the dark blue Maserati. This just has a nice feeling. 1 pts: c0wb0y007, M3 GTR: Another perfect panning shot. Wow! Thank you all you guys voted for me, I never inteded to make a POTM with that picture, lol!